The exceptional 2006 Cos d'Estournel is composed of 78% Cabernet Sauvignon, 20% Merlot, and 2% Petit Verdot, 55% of the production was utilized. Revealing superb intensity for a 2006 as well as an inky/blue/purple color, and a sweet bouquet of blue and black fruits, licorice, graphite, and charcoal, this full-bodied 2006 possesses high levels of sweet tannin. This wine is characterized by a freshness and precision that give it a 1996-like affinity. Enjoy this beautifully concentrated, exceptionally pure, statuesque Cos d'Estournel over the next 20-25 years. By the way, it was bottled without any fining or filtration. Jean-Guillaume Prats told me that yields were a modest 38 hectoliters per hectare, and only 55% of the production made it into the 2006 Cos. The harvest took place between September 21 and October 6, and the final blend is dominated by Cabernet Sauvignon (78%), followed by 20% Merlot, and 2% Cabernet Franc. The dense ruby/purple-tinged 2006 recalls such vintages as 1988 and 1996. It offers a classic bouquet of incense, licorice, pain grille, black currants, truffles, and flowers. Medium-bodied and concentrated with moderately high tannin, it will require 8-10 years of cellaring, and should keep for 30 or more. It is another terrific effort from an estate that has done everything right over the last decade. 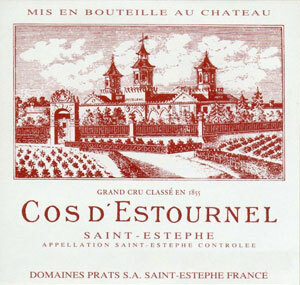 The 2006 Château Cos d'Estournel has a far superior bouquet to the Montrose, much more fruit intensity with ferrous red berry fruit, hints of undergrowth and Indian spice (most appropriate!). The palate is medium-bodied with supple Merlot-driven savory red fruit, a little grainy in texture with moderate depth, leading to a spicy finish that seems quite forward for a Cos d'Estournel at this juncture. There is no harm in drinking this now, though I wager that it will offer another ten years of pleasure. Just don't expect it to be your favorite Cos d'Estournel in recent years. Tasted at the château. A lush opulent nose with black cherries, cassis and iodine, all with great definition and well-integrated new oak. For me this is a flamboyant, confident Cos d'Estournel, without the sophistication or depth of the 2005, but with lots of charm. Notes of blackberry, violets and a touch of graphite with an unusually floral finish with a Burgundian lightness of touch. Touch of espresso on the aftertaste. Very fine, although if I had to choose between this and Calon-Ségur, I would opt for the one with the heart. Tasted April 2007. Wonderful aromas of violets and berries, with a mineral undertone. Full-bodied, with a solid core of fruit and tannins. Firm and chewy, tannic and muscular. Midpalate of fruit that builds on the palate. Almost 95-100. Precision viticulture techniques such as the use of gps and an electromagnetic sensor have enabled Cos to obtain much more accurate information on water availability and soil type across the estate. As a result, the vineyard is now divided into 97 different plots, each one treated individually. In the new chai currently under construction there will be 97 different tanks to keep these plots separate during vinification. This means that the potential quality of each parcel of fruit can be realised. 55% of the total crop went into the grand vin. Very deep, very cabernet (78%) right out to the rim. Intense - very lively real energy in this wine. Much more solid and more obviously fruity than the more ethereal lafite next door - but a very fine wine with great balance and zest and a bit of ink on the finish. Glossy, meaty, even slightly salty. Very long-term wine but non-aggressive tannins. Good deep ruby-red. Expressive aromas of dark raspberry, smoked meat, black olive, iron, smoke and tobacco. Lush, broad and sweet, with a deep smoky, meaty sweetness and outstanding palate coverage. For all its breadth and silkiness, there's no shortage of energy and definition. Finishes impressively long, with chewy, sweet tannins that dust the front teeth. Good medium red-ruby. Musky aromas of dark fruits, smoky herbs, pepper, menthol and game. Then surprisingly sweet on entry before turning masculine and broad-shouldered in the middle, with impressive volume. Serious, smoky, soil-driven flavors of dark fruits, menthol and minerals. The solid tannins saturate the front teeth and the sides of the mouth. The IPT (indice de polyphenols totaux) here is a very high 91, compared to 89 in '05, 86 in '03 and 78 in '07. Not at all an easy style; in fact, this may well need a full 12 to 15 years of cellaring. Savoury, gamey blackcurrant and sloe, very concentrated and dense. The tannins are firm but feel ripe and although, at this stage, they envelop the fruit, there is richness and sweetness coming through on the finish.